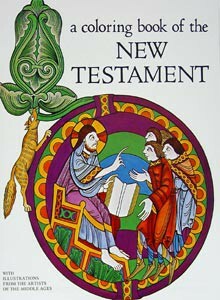 A Coloring Book of the New Testament. This is largely from the renowed St. Alban's Psalter, but other early romanesque manuscripts are used, The scenes are ready to illuminate. Students will delight in this beautifully detailed coloring book published by Bellerophon. Each page is titled and some have scripture references. All ages. Approx. 25 pages.